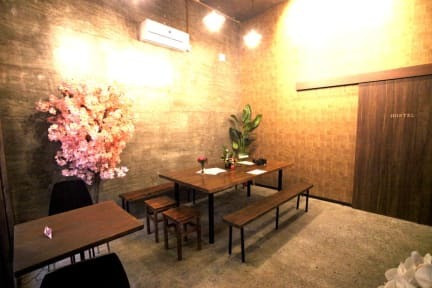 Newly open hostel in city of Namba !! Super friendly staff. Cafe and bar are also inside of our hostel. -Bland new bunk bed.2m long bed.Each bed has some space where you can put your personal belongings, a reading lamp and an outlet. Overall this was an amazing Hostel. Yuki was a very kind host and suggested some places to visit and to eat at. And it was so worth it. I can just recommend this Hostel to the fullest! This was a great hostel located in a quiet street of Osaka. The owners were super friendly and helpful and made sure we could get into the hostel when our flight was delayed. The rooms are clean and practical. The location is good, near a number of metro stations and in walking distance of various attractions. The free breakfast is a bonus too! A week at this hostel is like a week in the best Airbnb home in the old days. Yuchi was so nice, pleasant and helpful to all of her guests. No party, just relax and chill out. Domo Arigato Yuchi. Funtoco is a small family-run hostel that is in the heart of Osaka and is close to almost 3 train lines so commuting around town is easy. There is plenty of space to lock up your luggage and the staff were helpful and kind. The kitchen has everything you need if you wish to cook a meal. The facilities were clean and tidy. This is a more quiet hostel however due to its small nature, everyone talks to each other and becomes friends. The hostel was easy to find and ran by a very lovely and friendly family, baby yuzu was very entertaining and was definitely the boss of the hostel. The rooms were adiquite for the price but the only point I would raise was that due to the fact the family had a young baby it was a little hard to ask for anything with out feeling like we were being a nuisance, for example we travelled a long time to get to osaka and it would have been nice to grab a beer at the bar but it was unattended. Lovely owners and hostel! Has everything you need. On the quieter side but easy to get to the centre and right by Den Den Street. Had a lovely stay, thanks! beds are SUPER comfortable, great kitchen, nice showers, and walking distance to lots of different sights. on a bit of a side street that at first seems like its the middle of nowhere, but then you realize that its actually very well situated! The hostel is located a bit far away from the Osaka station in an old industrial area. That didn’t really matter to me as I wasn’t travelling much around Osaka but taking day trips elsewhere. Staff were really nice and facilities were great! Just watch out for the staircase up to the common room. It is the steepest I’ve seen in any residential building. Would stay here again.